Highlighter to remind your students to write their name on their work! 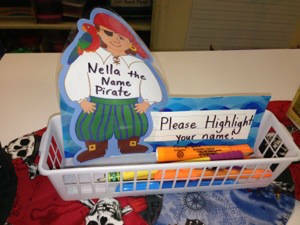 In the basket will be highlighters, student must highlight their name before they are able to turn their work in. I keep this basket right beside the completed work bin. If the student goes to highlight their name, and they did not write it, then they can pick up a pencil from the basket and write their. This has cut down on a lot of “no name” papers, even in Kindergarten!